Entersect is the nation's leading provider of accurate, complete and cost efficient investigative information. Entersect is the nation’s leading provider of accurate, complete and cost-efficient investigative information on a majority of the U.S. adult population.Our skip tracing software contains billions of current and historical,cross-referenced public records to ensure your search is done right the first time. Entersect serves government and law enforcement to ensure they can locate anyone, anywhere. Our proprietary investigative database cross-references billions of records to deliver search results in near-real-time. Entersect is a SaaS-based investigative solution that uses cloud computing and proprietary search algorithms to deliver the most complete searches and comprehensive investigative reports in the industry. Our online skip tracing database can be used wherever there is an Internet connection, whether in an office or on a mobile smartphone or tablet device. Government and Law Enforcement have instant access to billions of online public records to conduct person, phone, address, email, social security, civil records, criminal background, and motor vehicle searches. This information can be used to locate individuals, assets and witnesses; verify identities; and check court records. Entersect provides public and non-public information to those entities who qualify to receive this information under governing laws and acts, including the Gramm-Leach-Bliley Act, IRSG Principals and the Driver Privacy Protection Act. Ron brings over 20 years of experience building and running technology companies in both the private and public sector to Entersect. Prior to Entersect Ron was the CEO of TRI Holdings, Inc. a holding company invested in telecommunications, mobile, e-commerce, new media, content, WiFi, VoIP, financial services, software development, real estate and the human resources industries both domestically and internationally. Ron takes a hands on approach on building and running businesses leading a team of professionals to achieve our corporate goal of providing SaaS and DaaS solutions for government agencies,law enforcement, investigators, financial and insurance institutions as well as the legal industry. Alyssa is responsible for managing the Sales Team at Entersect. Prior to joining the Entersect team, Alyssa utilized the Entersect services on a daily basis while working in a management role overseeing investigations at a nationwide Private Investigation firm that has been established for over thirty years. Joining Entersect from the user aspect of the product gives Alyssa a unique perspective and allows for invaluable insight and understanding of what our clients’ needs are. Alyssa holds a B.S. in Criminal Justice from Fitchburg University. Amanda oversees day-to-day operations. This includes the company’s pre-employment screening division, Background101.com, and investigative databases, LocatePLUS.com and Entersect.com. 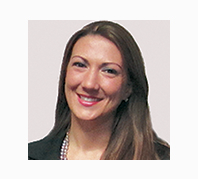 Amanda brings to her role in-depth knowledge of both the organization and the company’s various products and services. Throughout the past seven years, Amanda has held multiple leadership positions across sales, customer service, product development and operations. Amanda holds an Associate degree in Business Administration. Amanda has also been certified in the Fair Credit Reporting Act (FCRA) by the Consumer Data Industry Association and is a member of the National Association of Professional Background Screeners (NAPBS). As the Director of Information Technology, Steve establishes, plans, and administers the overall policies and goals for the information technology department. He analyzes the needs of different departments and determines ways to meet business objectives by modifying existing or developing new information processing systems. He also oversees the business rules of each division within the company, and maintains a secured environment that is PCI, GLBA, and ISO 27001 compliant. Steve has more than 20 years of experience in software development. He has worked in various industries for companies such as RBS Citizens Bank, Demandware, and Eaton Vance. In addition, Steve managed his own software development firm for 10 years, with Lotus/IBM as a notable client. Steve is a veteran of the United States Army and is an Eagle Scout.